It was another gorgeous day at Anderson University with the temperature rising a bit during the Colts afternoon shelled practice. In 11-on-11 work to end the day, Andrew Luck completed eight consecutive passes but a Darius Butler interception near the goal line ended the day on a high note for the Colts defense. T.Y. Hilton continues to make plays: Building off a productive rookie campaign, T.Y. Hilton appears to be poised for another strong season. Last year, Hilton battled a quad injury all through the offseason but this year he has been out on the field and making plays. Hilton is catching everything thrown his way. He had the catch of the day with a diving, over-the-shoulder grab on a corner route near the sideline. He might not be running with the Colts base formation but rest assured that Hilton will get his touches in 2013, and with that should come numerous “chunk” plays for Pep Hamilton’s offense. The Butler is always lurking: Darius Butler was one of the unsung heroes last season after the Colts signed him during the bye week in late September. He would go on to intercept four passes in 2012 and returned two of those picks for touchdowns. Butler has been extremely active through the first two days of camp, continually making plays on the ball. In a pass happy NFL, some of the game’s best passers are scattered across the Colts schedule this year. 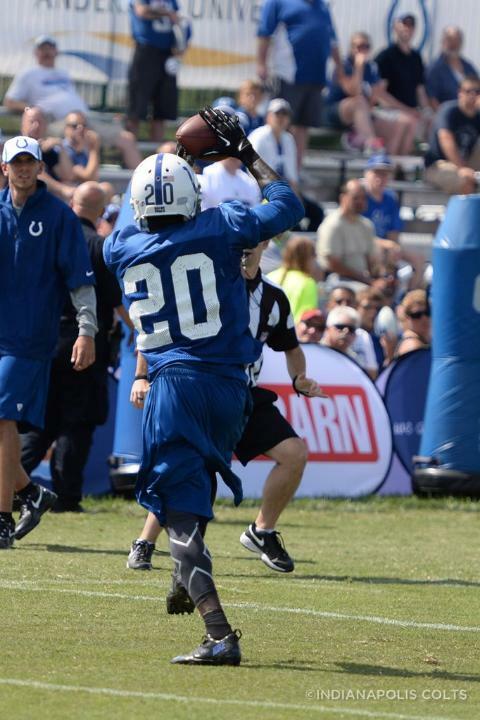 That means Butler will be an important cog in the Colts secondary even if he doesn’t run out with the starting 11. Inside Linebackers starting to make noise: Of all the positions on the Colts defense, the inside linebackers don’t seem to be attracting a ton of attention. You couldn’t tell that by watching practice on Monday. Kavell Conner’s No. 53 kept on appearing after pass deflections. The former seventh round draft pick continues to carve out a solid NFL career and was the Colts fourth leading tackler last season. Both Conner and Jerrell Freeman made some plays during 7-on-7 work, a time that is usually where the receivers and corners tend to dominate. The inside position doesn’t have the names of Landry, Mathis or Werner but don’t underestimate the potential depth the Colts have in the middle of their four-linebacker set.